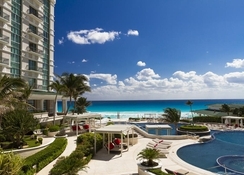 The Sandos Cancun Lifestyle Resort is an all inclusive hotel, located on one of the best beachfronts in Cancun. 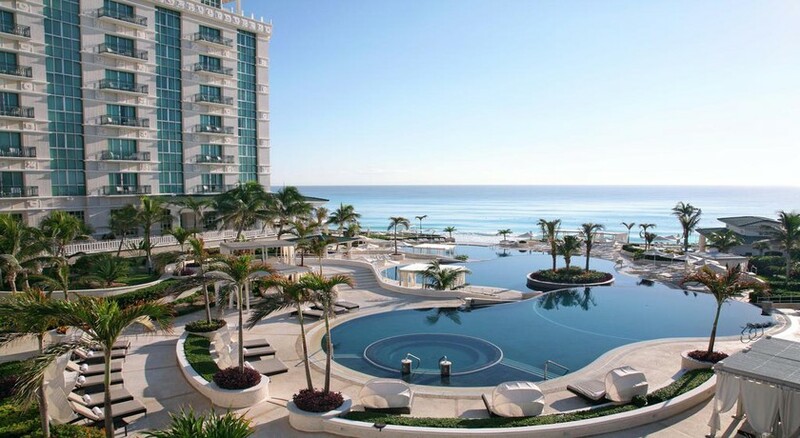 This luxurious hotel features three infinity pools which cascade down towards the white-sand beach and the Nichupte Lagoon (plus a large hot tub), an elegant spa and fitness centre, two full-size tennis courts, and access to the gorgeous beach and its variety of watersports. 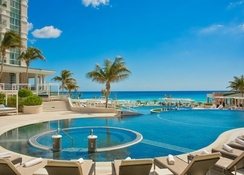 Sandos Cancun Lifestyle Resort's rooms boast wonderful views and sophisticated furnishings, equipped with amenities including a 32-inch plasma TV, safe, minibar and marble bathroom with bathrobes and slippers. When you're not relaxing on the deluxe balcony, discover the hotel's dining options with seven restaurants and bars to indulge in, including a buffet-style restaurant, two a la carte venues and cocktail bars to lounge in. Outside of the 5-star resort, watersports lovers will be in their element at nearby AquaWorld, or why not plan a day-trip, tour or excursion through the hotel? 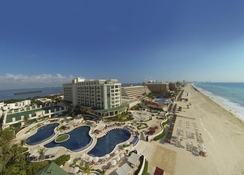 Sandos Cancun Lifestyle Resort is situated right on the Cancun beach. 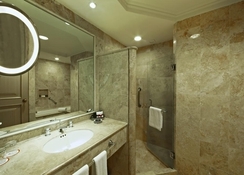 The Cancun International Airport is 18km from the hotel. The La Isla shopping mall is 2.6km. The Kukulcan Plaza, the ultimate destination for an extensive shopping experience complete with jewellery, is 1.8km. The address for a night of revelry, The City Nightclub is 5.8km from the resort. Rooms at Sandos Cancun Lifestyle Resort are plush and spacious, offering all modern amenities such as satellite TV, tea & coffee making facilities, a minibar, aromatherapy products and an in-room safety box. Guests can choose between Deluxe rooms with views of the ocean and the lagoon from the balcony, Superior rooms, Laguna Suites with two separate balconies and an extra bedroom and living rooms, Sandos suites and Caribe suites. Dining options are aplenty at the Sandos Cancun Lifestyle Resort with quality buffet and a la carte restaurants catering to International cuisine. Lose yourself in the aromas and tastes of the hotel's themed venues serving authentic Japanese, Italian and Mexican food. Treat your taste buds to a delectable breakfast buffet at Frattini’s, the a la carte restaurant. The Zango restaurant serves breakfast, lunch and dinner. The restaurant and bar St. Trop, poolside, serves gourmet snacks and Caribbean dishes. Gaijin Restaurant serves Asian cuisine and the Seasons restaurant offers cutting-edge cuisine. The hotel’s three outdoor infinity pools are a paradise. Guests can have a tennis match at the two on-site courts, head to the fitness centre and gym, soak up the sun at the secluded beach, plan an outside trip or relax at the pamper-ready spa with a variety of treatments on offer.